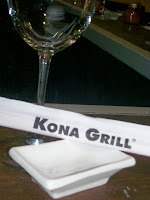 On September 8th you might have read my Hard Hat Lunch post on the under construction Kona Grill located at 1 E. Pratt Street. Just shy of 30 days and baby, they have come a long way. After seeing where they were on that day and being at the grand opening over the weekend, I am truly amazed.